I've done some reading on the subject on internet. 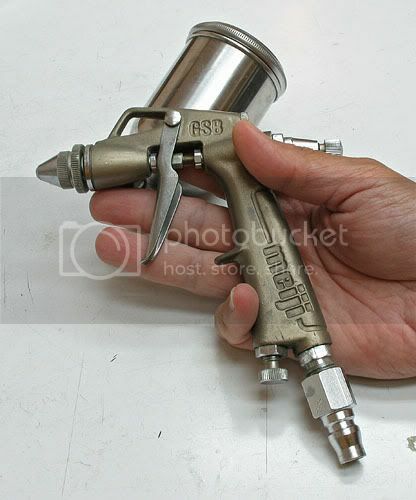 The setup should consist of a spray gun, air-compressor, air tank, water filter, etc. Anyone have experience with such equipments ? I expect it should be similar to those used in car repair workshops ? I know car repair workshops have high temperture room and professional equipments, which is out of my reach. My budget is within a few thousand hkd, so I have to spend it wisely. Someone said about using epoxy paint, is it the same as paint used on cars ? I'm looking for nice looking paint finish, that is more resistant to dings on landings. Which brand to use ? Where can I buy them all? I've just got myself a set of paint spray equipments on Saturday. It's the noisy compressor I've got. It's powerful, but you are right, it's impossible to use it during the night time! I can do my paint spray outside the house, in the day time only. I'll try to convert my vacume pump into a compressor for small repair jobs. If that doesn't work ! how much is the 靜泵 ? I might have to get one. For the repairs of the old planes, I got some epoxy paint to match, but they are very expensive at $60 to $80 per 1/4 liter. However, the six colours I bought, took them 1.5 hours to get the mixings done. So, they worth every penny I paid for them ! If I'm spray painting some new planes, less expensive paint will be better. How much did you paid for your "油霸" ? I'm now building the AMD P-51D, and will glass it and do my first spray paint job on it. how much is the 靜泵 ? How much did you paid for your "油霸" ?